Now, moving away from the topic of 3D, I’d like to ask about the exterior design. 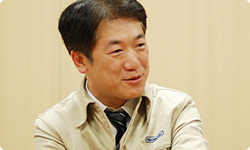 Sugino-san, when you and the others on the design team approached design of the Nintendo 3DS system, you first made a model of the size you wanted it to be. When we made the Wii console, we set a target size, about the volume of two or three DVD cases, which is similar to what you did this time. Yes. But I had set a small target size and worked toward that during development of Game Boy Pocket as well. This time, however, we didn’t just set a target size, we made a model to represent just how small it would be physically possible to make it. No matter how hard you try, there is a limit to how small you can make something. And this is the first model we made. Oh, right. Although the final product is a tad bigger. We thought that no matter how hard we tried, this was the minimum. Later on, staff members told me that making this minimum model was a horrible thing to do (laughs) - that it was easy for the others to misunderstand that we would be able to make it that size. When we made this model, it still didn’t have cameras. 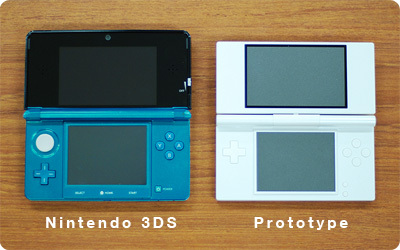 Then we decided on the 3D LCD and the Circle Pad to make it more comfortable. 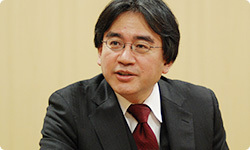 Iwata-san, do you remember this prototype? Yes. You could change the location of the Circle Pad and +Control Pad like building blocks. We considered where to place the Circle Pad for the easiest play - above the +Control Pad or below it - by having people try out this model. It was a working model, so we could actually play games. There were scores of ideas about where the Circle Pad and +Control Pad should be, so it took awhile to decide. Some even said that we should get rid of the +Control Pad and just have the Circle Pad. In the end, we put the Circle Pad up above. You tried out quite a few designs for the Circle Pad. Tons. Even after the 2010 E3, we kept adjusting the size and form of the Circle Pad. I’d like to ask about E3. 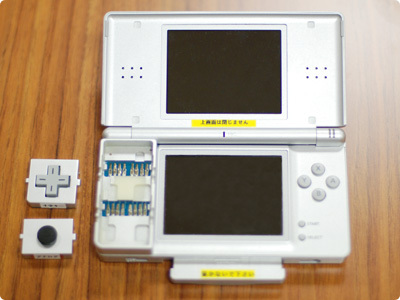 We decided pretty early on to exhibit Nintendo 3DS at the 2010 E3, but I think that caused a lot of trouble for you developers. In order to be in time for E3, I was constantly pressing them to make certain decisions by certain days. Exactly what kind of challenges did you face? As mentioned earlier, I designed the chip without any thought of 3D, so we had to change the design quite a lot, like doubling the graphics rendering speed. I was really worried about whether we could make a chip that players could actually use in time for E3. And of course we couldn’t ask E3 to change its schedule on our account. Right. I asked those involved with the SoC to do the impossible, and with regard to polishing it off, I think Sugino-san had a rough time of it, too. I told Sugino-san that I wanted several that looked like the final product for when I revealed Nintendo 3DS to everyone at our E3 media briefing. And I said that given the time constraints I didn’t care if they used big ol’ things like sandwich boxes - as long as they ran, that is - for the ones that the players used in the exhibition hall. That’s how badly I wanted to exhibit working models at E3 so players could experience the 3D. But you actually prepared a lot that looked like the final product in the end. In the end, we prepared about 200. I told the staff that you were fine with sandwich boxes, but they wouldn’t buy it, so they buckled down. When you think about the schedule after that, we needed to be bringing it to some semblance of form anyway. We needed to perform evaluative tests on a prototype before mass production. It only becomes fit for production after passing a variety of such tests and thereby gaining approval as a Nintendo product. Those tests were another reason I wanted to be in time for E3. But when we started making the prototype around January of 2010, the schedule was looking tight, so I couldn’t tell you we’d do it. Then, like a bolt out of the blue, the idea of putting in a gyro sensor23 came up. 23Gyro sensor: A measurement device. Its uses include calculating angle and rotation speed and controlling position. The term "gyro" refers to a "ring" or "rotation". (laughs) The idea of 3D overturned a big tea table, but how about the gyro sensor?